Pen and brown ink, brown and gray wash, heightened with white gouache (partially oxidized), traces of black chalk, on light brown laid paper. Inscribed at lower left, in pen and brown ink: "d'apres Parmens"; on verso, in pen and brown ink: "Parmens". Armand Francois Louis de Mestral de St. Saphorin, Switzerland; Alfred Bovet, Switzerland; Eugène Burnand (1850-1921), Paris (Lugt S. 314d); purchased in Geneva in 1972 by János Scholz (1903-1993), New York (see Lugt Suppl. 2933b). British Museum, London, inv. 1950-4-1-6. Göteborg Kunstmuseum, Gothenburg, inv. Hdt 23/1915; Turner, in Modena 2005, 372-73, no. 153. Selected references: Scholz 1976, 14, no. 39 (as Nicolò dell'Abate); Fellows Report 1981, 173 (as Nicolò dell'Abate); Turner, in Modena 2005, 372-73, under no. 153 (as copy after Nicolò dell'Abate). Scholz, Janos. 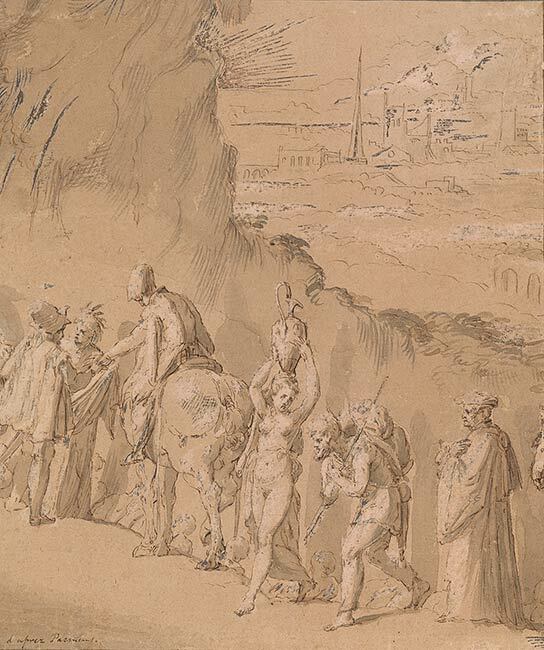 Italian Master Drawings, 1350-1800, from the János Scholz Collection. New York : Dover, 1976, no. 39, repr. Ryskamp, Charles, ed. Nineteenth Report to the Fellows of the Pierpont Morgan Library, 1978-1980. New York : Pierpont Morgan Library, 1981, p. 173.